Definitions: “You” and “Your” means the person accessing the Website and paying for Goods ordered. “Us” and “We” and “Ourselves” means David Barry Limited trading as David Barry Outlet and include any other party to whom We may owe a duty of obligation and include any other party to whom Our rights and/or liabilities under this agreement may be transferred. "Distance Selling" means a method of selling Goods other than in person and includes, but is not limited to, electronic sales, mail order, telephone, email or fax. "Contract" means any contracts made between Ourselves and You for the sale and purchase of Goods from Our Website or via other forms of distance selling. "Goods" means any garment, product, article and/or item that We sell via Our Website. "Order" and/or "Ordering" means any requests (whether oral, written or electronic) for Goods placed by You including those made through the Website with intention to complete payment. “Service Providers” means any third party whether individuals, companies, organisations or otherwise, undertaking outsourced provision of necessary commercial activities involved in the process of fulfilling delivery of Your Order. This may include but will not be restricted to debit card/credit card payment processors, Website developers, Search Engine Optimisers and other digital media specialists, manufacturers, suppliers, shipping carriers, fraud prevention agencies, collection agencies, consultants and affiliates. "Website" means http://www.davidbarry.com/outlet or variations of the aforesaid domain name that may include alternative URLs and top-level-domains (e.g. .com, .eu, etc). References to any statute or statutory provision shall, unless the context otherwise requires, be construed as a reference to that statute or statutory provision as from time to time amended, consolidated, modified, extended, re-enacted or replaced. References to the masculine include the feminine and the neuter and to the singular include the plural and to the lower case include capitalisation and vice versa as the context admits or requires. Headings will not affect the construction of these Conditions. 1.1 The Website is owned and operated by David Barry Limited. Our registered office is: c/o Haslers, Old Station Road, Loughton, Essex IG10 4PL. Our trading address is: 21 Fowler Road, Hainault Business Park, Ilford, Essex IG6 3UT. 1.2 All rights reserved. Unauthorised use, copying or modification is prohibited. 2.1 David Barry Limited (“David Barry Outlet”) supplies Your Goods and has a nominated data controller of information that You provide when You Order. 2.2 In accordance with the Data Protection Act 1998, We hold a current Certificate of Registration with the Information Commissioner’s Office, reference number: ZA033470. 3.1 When buying Goods and services on the Internet, You are entering into a legally binding contract. 3.2 Among several pieces of legislation, We comply with the Consumer Rights Act 2015, the Sale of Goods Act 1979, the Unfair Terms in Consumer Contracts Regulations 1999, the Consumer Protection (Distance Selling) Regulations 2000, the Sale and Supply of Goods to Consumers Regulations 2002, the Electronic Commerce (EC Directive) Regulations 2002, the Price Marking Order 2004 and the Consumer Protection from Unfair Trading Regulations 2008. The latter implemented the European Union-wide Directive 2005/29/EC concerning unfair business-to-consumer commercial practices in the internal market ('Unfair Commercial Practices Directive'), known as UCPD. The aim of the UCPD is to harmonise consumer protection laws across the EU to prevent business practices that are unfair to consumers. The regulations replace certain elements of consumer protection legislation, including Part III of the Consumer Protection Act 1987, the majority of the Trade Descriptions Act 1968, and the Control of Misleading Advertising Regulations 1988. The regulations apply to commercial practices before, during and after a contract is made. For more information about consumer rights, please contact your local Trading Standards Office and visit the government website www.legislation.gov.uk. 3.3 Similar to most online retailer sites, David Barry Outlet operates 'shopping cart' order processing. To purchase Goods, select Your desired options (e.g. number of items, size, colour, etc.) and then click the relevant buttons (e.g. 'Add to Cart', etc.) to proceed to the checkout pages for payment. You have the option of creating an account with Us or You may choose to Order and pay using guest login. 3.4 We offer payment options via PayPal and Klarna (UK only), which means you can pay using a credit card, debit card or PayPal account. 3.5 All prices for retail customers shown on Our Website are inclusive of VAT. 3.6 Foreign currencies: In addition to accepting payment for the purchase of Goods in Pounds Sterling (GBP), we accept payment in Euros and US Dollars (USD) . If you are Ordering in currencies other than GBP, the shopping cart will display the price of Goods in Your chosen currency together with the conversion rate and any commission to be charged if applicable. English and Welsh law applies in the event of any dispute. 3.7 After an Order is submitted, You will receive an email confirming that We are processing Your order. A follow-up email will notify You of estimated timescale for delivery. Please check both emails for accuracy and let Us know immediately if there are any errors. 3.8 Subject to Our full Terms and Conditions, an Order is accepted by Us (whereby a contract is formed between us) upon payment in full, whereby title to the Goods will pass to You and we will ship the Goods to you. Until We have received cleared funds in full (also applying in the event of default of any payment), We retain legal title of Goods including the right of resale. 3.9 Promotional codes allow You to benefit from a range of special offers that may include discounts, free delivery, free gifts, etc. Codes are non-transferable. Please check eligibility, confirming that You are entitled to use the code, that You meet all the conditions that apply to its use and that You agree to these terms and conditions. 3.10 If, before accepting Your Order, We determine that You are not entitled to use a promotional code or do not meet all the terms and conditions of its use, We may reject Your Order or alternatively process it without the promotional benefit being applied. If, after Order acceptance, We find that the code was ineligible or You breached conditions, We may reverse any benefit that You obtained. We reserve the right to charge a further payment to your debit card, credit card or PayPal account, equivalent to the value of the benefit obtained, from the card used. 3.11 We try to keep Our Website up to date and error free, however, descriptions or pricing errors or stock availability discrepancies may occur. If We discover such an error after You have submitted an Order to Us, We will contact You prior to acceptance with the correct details. In the unfortunate event that We are out of stock of Your chosen Goods, We may offer alternative Goods (e.g. same style but substituted in a different colour or size, etc). You may then either cancel Your Order or reconfirm it based on the correct information. If We are unable to contact You, We will treat Your Order as cancelled. 3.12 In accordance with the Consumer Rights Act 2015, You have the right to cancel Your Order within fourteen working days. This period runs from the day after delivery of Goods. 3.13 Should You wish to cancel Your Order or return Goods, please refer to Clause 4 Returns Policy for details. 3.14 We keep details of all Orders placed, whether by telephone, post or via the Website. In the event of any dispute arising in respect of an Order, Our records will be accepted as the true and original terms. If You are in any doubt whatsoever as to the details of any Order You have placed You should immediately contact us for clarification. 4.1 If You change your mind about Your purchase, please return the unused Goods to Us with the original receipt and We will offer You an exchange or a refund. This does not affect Your usual consumer rights, including Your right to cancel (Distance Selling) or claim a refund, replacement or repair and/or compensation where Goods are faulty or incorrectly described. 4.2 Goods must be returned unworn (in the same condition that You received them), with original tags attached, with the original packaging and proof of purchase. We operate quality assurance processes whereby Goods are checked before shipping. We accept that in rare instances, Goods may be faulty. However, Goods found to have been accidentally or deliberately damaged (e.g. buttons pulled off, etc) after leaving Our premises cannot be accepted for exchange, credit note or refund as this is beyond our reasonable control. 4.3 Other non-returnable items: Gift cards, down-loadable software products and some health/personal care items. 4.4 Once Your return is received and inspected, We will email notification that We have received Your returned Goods. If applicable, We will also notify approval or rejection of refund. If approved, then a refund will be processed, and a credit will automatically be applied to Your original method of payment within 14 days. 4.5 We are not obliged to refund a customer if they knew an item was faulty when they bought it or they damaged an item by trying to repair it themselves or by getting someone else to do it (though they may still have the right to a repair, replacement or partial refund). 4.6 Late or missing refunds: We aim to process returns and any entitlement to a refund as quickly as possible. If You haven’t received a refund yet, first recheck Your bank account. Then contact Your credit card company, as it may take some time before your refund is officially processed. 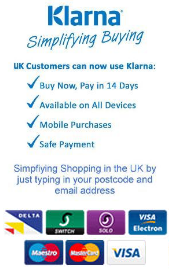 Next contact Your bank or Klarna if that was your chosen payment method. There is often a processing delay before a refund may show on your bank statement or credit card statement. If You have done all of this and You still haven't received Your refund, please email outlet@davidbarry.com. 4.7 Gifts: If the Goods were marked as a gift when purchased and shipped directly to You, You’ll receive a gift credit for the value of Your return. Once the returned Goods are received, a gift certificate will be posted to You. If the Goods were not marked as a gift when purchased, or the gift giver had the order shipped to themselves to give to You later, We will send a refund to the gift giver and they will be notified about Your return. 4.8 To return your item, you should post it to: Returns - David Barry Outlet, David Barry Limited, 21 Fowler Road, Hainault Business Park, Ilford, Essex, IG6 3UT, United Kingdom. 4.9 You will be responsible for all postage/shipping costs (including Customs Duty or Import/Export tax, if it becomes due and is applicable) for returning Your Goods. 4.10 If You are returning an item You should consider using a trackable shipping service (e.g. Post Office, Royal Mail, Recorded Delivery, etc.) and/or purchase post/courier insurance and keep receipts until return delivery is confirmed. 4.11 You are entitled to an exchange, subject to the item being in stock and we consider it to be a suitable replacement. We will cover the cost of return shipping to You. Depending on where You live, the time it may take for exchanged Goods to reach you may vary. 4.12 In accordance with your statutory consumer rights, if You are entitled to a refund, this will include the cost of shipping the original Order to You (Consumer Rights Act 2015,). 5.1 We cover most of the UK's remote postal addresses in Northern Ireland, offshore islands and other remote areas, unless we cannot cover your area due to inaccessibility or other event. 5.2 We aim to deliver Goods within three working days via standard shipping methods. Goods are usually sent within the UK Mainland by Norsk Global/Yodel 2-4 days service, TNT Next Day or Royal Mail Tracked or 1st Class Recorded Delivery or Saturday delivery (Monday to Friday) and Royal Mail International Signed For or Tracked service and Norsk Global International Tracked. An additional supplement may be paid for Saturday Delivery (Royal Mail Special Delivery Next Day With Saturday Guarantee). We reserve the right to select alternative transport or postal services. Where Next Day delivery has been specified, we aim to deliver Goods within one working day (some remote areas may be excluded from Next Day service). 5.3 Whilst We make every effort to deliver Goods within three working days or one working day if Next (working) Day delivery is selected, We cannot be held responsible for our third party carriers service which is subject to their own terms and conditions of service and available on their own company websites. All items purchased before 12.00pm Mondays to Fridays will be dispatched the same day. We can only provide next working day delivery for purchases made Monday to Friday before 12.00pm. This also applies if any Goods are sent direct from Our Service Providers. We shall attempt to resolve any delivery issues that may arise. We shall refund for payment of Goods and shipping costs incurred due to failed delivery or offer an exchange or gift card to an equivalent value if required but We cannot accept liability for any other costs or out of pocket expenses. 5.4 All Goods are subject to stock availability. 5.5 When We deliver Goods, You may be asked to sign to acknowledge that You have received them. 5.6 If Goods are faulty, please refer to Clause 4 Returns Policy and contact us. We will investigate, with the aim of ensuring a satisfactory remedy. Some remote UK postal addresses may not be covered by our delivery services due to inaccessibility by carriers or factors beyond our control. If we do deliver to your area, it will be confirmed at Checkout when you enter your Post Code. Orders for Next (working) Day and Saturday Delivery must be received by 12 noon GMT the day before. INTERNATIONAL SHIPPING RATES SLASHED - ITS NEVER BEEN EASIER TO MULTI-BUY! Any customs or import duties may be charged once the parcel reaches its destination country. If these charges are due, they must be paid by the recipient of the parcel. We have no control over customs or import charges and cannot predict what they may be. Customs policies vary widely from country to country; you may want to contact your local customs office for further information. You will be responsible for all postage/shipping costs including Customs Duty or Import/Export tax if it becomes due (and is applicable) for returning Your Goods. Our carrier will deliver your parcel between 7am and 9pm. A signature may be required on receipt. If you are not around to accept your parcel, the carrier may leave it with a neighbour, or in a safe place (i.e. hidden from sight and protected from the rain) if they think it is safe to do so. A calling card will be posted through your door to let you know this has been done. If the parcel can't be left in a safe place or with a neighbour, the carrier will take it back to the local depot, and leave you a card telling you how you can pick it up. If you order anytime over a weekend, we will ship your goods on the following Monday except on a Bank Holiday Monday when we will ship your goods on the following Tuesday. Orders placed on a Bank Holiday will be processed and despatched the next working day. We do not deliver on a Bank Holiday so please be aware of any impending ones when you order. A tracking reference will be sent to you once your order reaches the carrier we are using for your delivery, for you to be able to follow it all the way to your front door. When you place an order, we suggest you have it delivered to a work address rather than a home address, as our couriers only deliver between 9am and 5pm and may require a signature on receipt. 5.7 From time to time we operate promotional activity that may include free shipping. Pursuant to Clause 3 and Clause 4, any refund entitlement for Orders processed during a free shipping promotion will not include refund of shipping costs. 6.1 We are committed to detecting and preventing fraud. For everyones protection, We use prevention methods and tools. We check the details of every first order with a fraud prevention agency and these checks may be repeated with future orders. We may use information You have given, or which We already hold about You. Pursuant to Clause 2, if You are accessing Our Website, We may use and share information it receives relating to the device You have used to access Our Websites. If false or inaccurate information is provided and fraud is identified, proceedings may be brought. Police constabularies, the courts and relevant collection or other agencies may access and use such information. 6.2 Our Service Providers may also access and use this information to prevent fraud and money laundering, e.g. checking details: On applications for a credit-related account (e.g. bulk-buy traders) When recovering debt; On returns; For all types of insurance claims; Of job applicants and employees. Our Service Providers and regulatory bodies may also access and use from other countries the information recorded by fraud prevention agencies. 7.1 Other than in instances of Our authorised use of third-party intellectual property on or via Our Website and company literature, all such rights (including but not restricted to use of trade marks) are solely owned and reserved by us. 7.2 Any unauthorised use of material on this site is strictly prohibited. 7.3 Our rights, and those of Our Service Providers, are protected by UK, European, and International intellectual property laws, including those for the protection of copyrights, trademarks, and database rights. Misuse of the Website may incur civil liability or be subject to criminal proceedings. 7.4 We grant You a limited, non-exclusive and revocable licence to access Our Website for the purposes of browsing Our (or Our affiliates) product offer(s), ordering Goods or services from us (or Our affiliates), or obtaining contact information for us (or Our affiliates). 7.5 Your licence to access Our Website does not extend to any commercial use of Our Website, or to any use of Our Website whatsoever which is for the benefit of any commercial entity other than Our own (or those of Our affiliates). 7.6 You are expressly not permitted to download any part of Our site (other than by reason of automatic page caching) to amend or modify it or any part of it, to reproduce or copy, sell (including any resale), or otherwise exploit Our Website (or any part of it) for any purpose other than as set out above, nor are You permitted to frame Our Website or to link to any element other than the homepage. 7.7 You are permitted to link to Our homepage, provided that the link is not misleading, false, derogatory, or otherwise prejudicial to Our (or Our affiliates) suppliers interests, but You are expressly not permitted to use any of Our logos or graphics either as or in connection with such a link. 8.1 All communications in relation to this agreement will be in English. 8.2 The use of Our site and any contracts formed are governed by the commercial laws of England and Wales. 8.3 Orders placed from overseas are subject to English and Welsh law. 8.4 All Goods are sold on the basis that they are for personal, domestic use only. 8.5 We shall not be responsible to You whether in contract, tort (including negligence) or otherwise for incidental, special, indirect or consequential loss or damage, any loss of profit (direct or indirect), loss of sales, loss of goodwill or reputation, loss of business, third party claims, pure economic loss arising out of or in connection of the performance or non-performance of Our obligations under these terms and conditions including such damage as may be reasonably foreseeable at the date that You order the Goods. 8.6 Nothing in these terms and conditions shall exclude or restrict Our liability for death or personal injury caused by Our negligence. 8.7 Our liability for any claim for loss or damage shall be limited to the sum paid by You for the Goods. 8.8 A person who is not a party to these terms and conditions shall have no right to enforce any term under the Contracts (Rights of Third Parties) Act 1999. 8.9 If any provision of these terms and conditions is found to be invalid or unenforceable by a court the invalidity or unenforceability of such provision shall not affect the other provisions of these terms and conditions. 8.10 We may assign or transfer any of Our rights or sub contract any of Our obligations under these terms and conditions if the business or part of the business is acquired by a third party, or if the business is restructured whereby Your personal information is transferred to a subsidiary company or companies. Pursuant to Clause 2, any subsequent transfer of Your personal information held shall be in accordance with Data Protection Act 1998 requirements and You will be notified in such instances. 8.11 You may not assign or transfer any of Your rights or sub contract any of Your obligations under these terms and conditions except with Our specific permission in writing. 8.12 We reserve the right to change these terms and conditions from time to time and any such changes will be notified via the Website. 8.13 There are links on Our Website to third party Websites which We believe may be of interest to You. We do not have any control over the content of these Websites nor can We be liable in respect of anything contained on those Websites. 8.15 We will use reasonable efforts to verify the accuracy of any product or pricing information which We place on the site but We make no warranties (whether express or implied) in relation to the accuracy of such information. 8.16 We may close Your account or terminate Our trading relationship by giving You notice of at least seven (7) days. This does not affect Your obligation to repay any amounts You owe to Us. 8.17 These Terms and Conditions supersede all previous versions, representations, undertakings and agreements. (Updated February 2017).